Woolworths Company was founded in 1924, in Sydney, Australia. It is an Australian company; it is a recognized and trusted brand. They have loyal customers across the world; the company has so many brands, Percy Christmas was a CEO of a company, the key principle of the company is that “Every man, women, and child needs a handy place where goods things are cheap”. The company is serving quality products from the years to its customers; the company is serving about 28million customers every week. Woolworths has the stores at different places or cities, the company has its own hotels, petrol, liquor, span food, home improvement etc. The company has the strong business, the company has given value to the culture and ethics, and this is the reason that company is known as a family-oriented. The company values the customers; a company is honest and fair to the customers, the company is focused on to working fairly with the entire supplier because members believe that to ensure good relationships are important to the customers so they can deliver value products. Company suppliers are the partners also, from the years, the company is having more than 80% of the suppliers as the partners. The company is focused on the innovation to keep consumers excited. Woolworths is serving the healthier products, the product are organic, natural and there are free ranges of the products, this is the reason that consumers are satisfied and trusting the brand from years. The company is offering the great financial services to the potential customers, to deal with the financial services there are Woolworths money is serving the customers, they have the wide range of services including gift cards, master cards etc. The company is serving the customers in various ways as Woolworth’s rewards also have loyalty programs; they are giving more ways to enjoy their money services to the loyal customers. 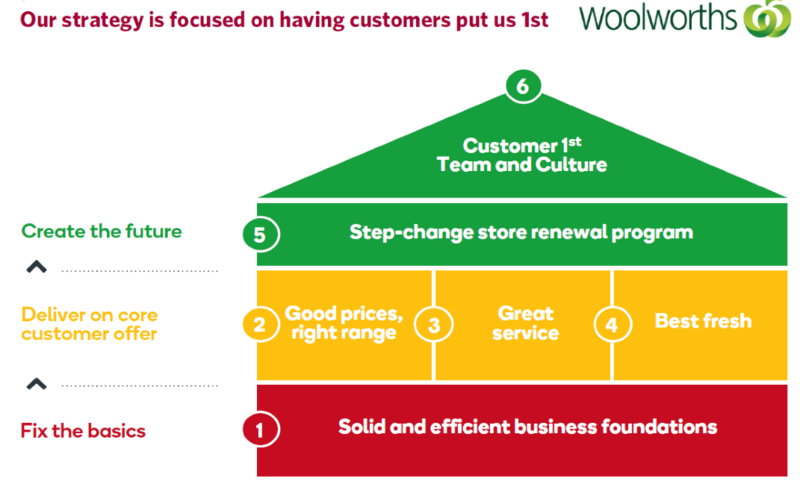 Woolworths has the strategies regarding the different or various business processes, however, the company is focused on the four key strategies, on which all the functions of the company take place. The company wants to expand the leadership in liquor and food; the company performs on the portfolio, so the stakeholder’s value can be maximized. If stakeholders are maximized then alternate, advantages can be there for the company or the company business. Another strategy of the company is to maintain the record of accomplishment, of the building so new opportunities for the business can be there. The company wants to put the place for the enablers so the there could be the new era of the growth. The company has focused on all the strategies, so benefits could be there for the company and all the stakeholders, the company is also focused on changing the business, so the business could be dynamic and exist (CAMERON, 2015). The company wants to give the growth opportunities to all the business they have. The company has given values to all the members, they did the analysis of all the behaviors, the quality of a product is being focused and that have understood that how customer shops and what they value. The company also focused on the strategies that are based on the future growth of shopping, as Woolworths focused on changing and adopting the changes regarding the technologies, they know that technology can serve them better in future and they have recognized the value of customers for the physical and stores. Woolworth’s business is the multi-option; the company is listening, acting learning from the customer’s experience and their feedbacks. Efforts are there for the betterments in all the process, so stakeholders can be more satisfied. In company Woolworth, Gordon Cairns is the chairman of the company, he has provided the detail of the financial year, in 2015. The chairman has shared the annual financial details that company has faced the issues and challenges, as he managed all the functions and has compared the financial years, he comes to know that dividends are slightly up one the last year. There were challenges for the company, due to which the managers of the company make the significant changes so that the stakeholders or the investors can be retained for the long-term. However, senior management was disappointed because the made strategies were not in the favor, the management changes the decision; as it was said by the chairman that 2015 will be remembered as the year with the significant changes. The challenges were the outline and significant focused were there, the company or management decided to increase a number of dividends. The company sales were not good or have given the results according to the expectations, the financial results have told that the there were lower fuel sales in the years and disappointments were there, the board review the capabilities and make the changes. The company has to face the retail challenges, the retail model does not compete with the new environment, the company still focus on to give the value to the customer’s shop that the betterment could be bought, however, the company Woolworth’s aims to grow by ensuring the right of the stakeholders or by satisfying them. The staff of the company contributed to the best services, which are needed to give every day so the customers can be retained for the long-term. Moreover, the retail model was also changed, to make the improved business model.